NEW YORK, New York—January 24th, 2018—In partnership with NYC Media Lab, Verizon has awarded 12 New York City university teams for the creation of new prototypes, with a specific investment in virtual and augmented reality (AR/VR) and artificial intelligence (AI) technologies. 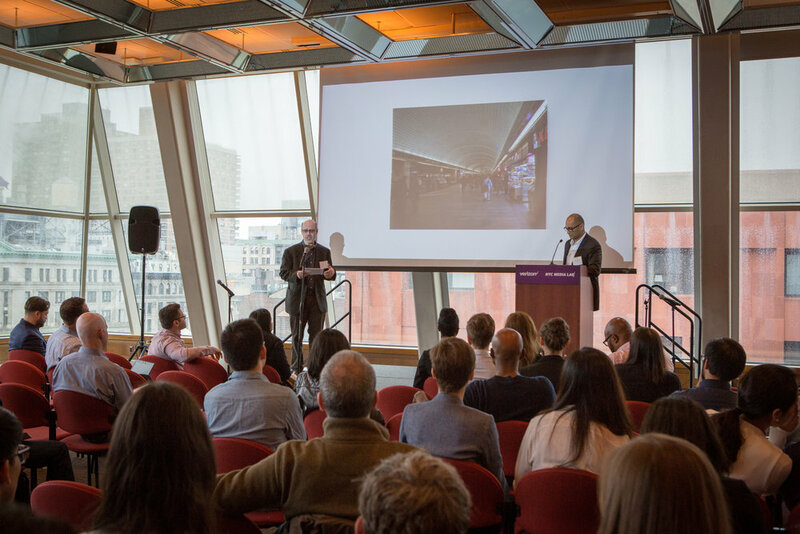 11 projects by students from Columbia University, New York University, Pratt Institute, The School of Visual Arts, and The New School will participate in the program. Teams will work specifically with leadership within Verizon Envrmnt, which builds immersive experiences for leading companies in advertising, digital media, professional sports and retail. Verizon launched the Connected Futures Prototyping and Talent Development program, now in its third year, to invest in cutting-edge prototyping. It is structured to form a pipeline between NYC universities and Verizon as the company seeks out the next generation of talent. NYC Media Lab, a public-private consortium of NYC-universities and civic partners, is key to forging these relationships. The program and its call for applications was announced in September 2017 at NYC Media Lab’s annual Summit, which hosted stakeholders from across the Lab’s consortium. Special Video: Verizon Connected Futures alumni share their experiences. The program also works to drive interest towards the Verizon Open Innovation Concept Studio, a 6-month program that engages creative technologists to tackle business challenges impacting the media and technology industry. To date, 16 talented engineers and designers have been hired by Verizon through its partnership with NYC Media Lab. Representatives from Verizon and NYC Media Lab visited campuses across the City in an 8-week recruitment process that culminated in a competitive applicant pool. Teams were chosen based on their vision for prototyping within one of Verizon’s chosen areas of inquiry: AR design and marked tracking; social VR/AR; and the intersection of AR and AI. What design concepts can be used to help AR reach broad penetration and user adoption? How can we empower multi-person communication in VR/AR experiences? And how can we imagine use cases of voice assistants or chatbots in VR/AR environments? These questions will inform the prototyping process, to proceed through March 2018. "We make magic when we pair leading students with outstanding mentors in the Envrmnt team at our AR/VR lab," said Christian Egeler, Director of XR Product Development for Envrmnt, Verizon's platform for Extended Reality solutions. "We discover the next generation of talent when we engage them in leading edge projects in real time, building the technologies of tomorrow." Teams will present their prototypes in a final Demo Day on March 23rd, 2018. To RSVP to the Demo Day, contact Alexis Avedisian, NYC Media Lab Communications Manager (alexis@nycmedialab.org). Learn about the projects below. University Program: Integrated Digital Media (IDM) Citytravelar is an AR app that augments existing subway signs to provide information to MTA commuters such as delays, routes and nearby landmarks. Hubble is a mixed reality tool for elementary classrooms that makes abstract concepts, like space, 3D and interactive. Impromptu is a multi-user AR experience that empowers non-musicians to participate in an audio visual jam session. for people with social anxiety disorders to practice for real-life situations. GLIMPSE: Inventing America is an AR journey taking us back to the 1620s when the first immigrants arrived in what is now New York City. Envrmnt is a comprehensive provider of enterprise-class, business-to-business (B2B) and B2B-to-consumer (B2B2C) extended reality (XR) solutions (AR, VR, and 360 video). They offer self-service tools which allow customers to easily configure and deploy their own immersive content, as well as professional services for the creation of custom experiences, all via their streaming platform.